Desi In China: A picture is worth a thousand words. A picture of a picture? 1000,000 perhaps! A picture is worth a thousand words. A picture of a picture? 1000,000 perhaps! So people told me that the Chinese language and script is fairly interesting on account of the fact that it is pictographic in nature. How tough could it be to understand a picture, I had asked myself early on in this assignment. It’s just a question of learning what picture means what, and one is home and dry. Turns out I had over simplified the challenge at hand. After two weeks of staring hard at every Chinese sentence construct and waiting for the hidden picture to emerge and make sense, the only thing that emerged was migraine – a good deal of it. Clearly the Chinese picture art had not kept pace with picture technology. Over a 100 years since Eastman revolutionized photography, we’ve seen the transition from grainy yellow monochromes, to pretty high resolution artworks. Clearly the concept of pictures has changed radically, and it would befit the Chinese to replace the 40,000 odd characters with more contemporary pictures so that everyone can make sense. 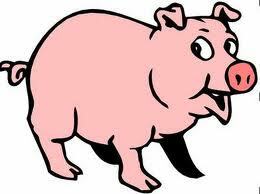 is the symbol for a pig… and is visible everywhere there is pork on the menu. What prevents them from using the more modern pig symbol? Don't be a Pig... use me instead! Also the Chinese-English-Chinese translation seems to befuddle me every time I hear any translation. Somehow the most concise statements in English (try something like ‘not possible’) seem to have a 20 minute translation in Chinese. We experienced this time and again, and I’m intrigued at how this actually works. 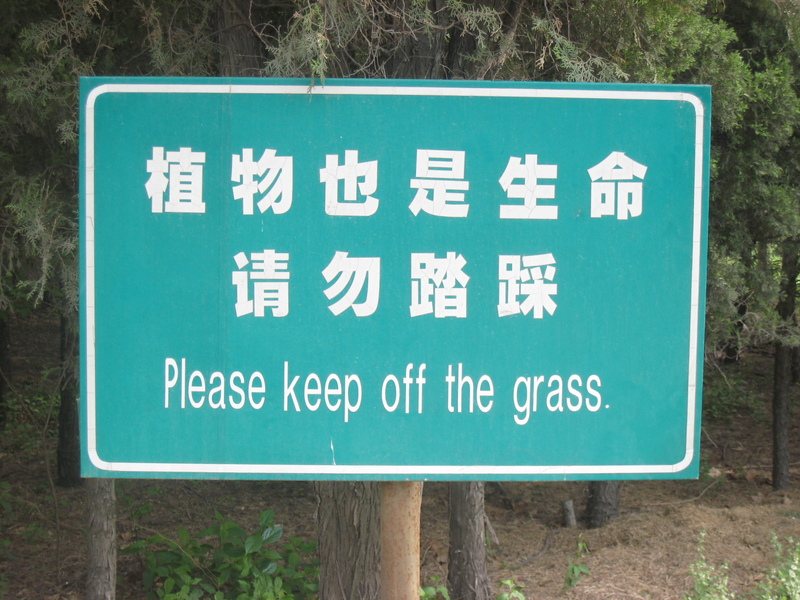 If I had to illustrate “Please keep off the grass” in some pictographic script, I would have grass with two human feet and a red cross on top of it. 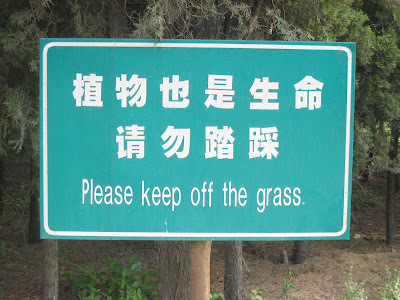 The Chinese equivalent possibly talks about the definition of grass, the concept of gardening it to pristine health; the ability of human beings to walk, as also the ability to walk over grass; and finally, the fact that this is strongly discouraged. Clearly something is lost in translation from English to Chinese... or rather something (some very big thing) is added in the translation. Rumor is that Tolstoy wrote "War and Peace" in Chinese and it was a 20 page short story. His publisher suggested a change of language and that is how the remaining 1680 pages were added!